When it comes to getting the word out there, social networks like Facebook offer a great way to engage with potential customers and stakeholders. Not only is Facebook the second most visited website in Australia, it boasts the greatest audience engagement of any site, giving you access to a market that has a higher reach than even commercial tv. On top of this, as a platform Facebook offers paid advertising tools that are second to none, which can give you feedback and metrics that will help you better target an audience as well as learning how effectively you’re conveying your message. To help you communicate online, I’ve compiled a few tips to get you started. Engage with your audience. Ask questions, promote discussion, and prompt people to share or like your posts. By doing this, you’ll improve your engagement with your audience, and increase the likelihood that they will see future posts that you make. Facebook displays messages based upon what they think each individual user will want to see – making likes and comments an important metric for building your brand online. Think about mobile users. The average Facebook user checks the website 14 times a day on their phone alone – so if your post or content is too long, or too hard to read on a phone, you’ll never connect to them. Use multimedia! Video and well produced photography are incredibly popular formats on Facebook. With more than 4 billion video views on Facebook around the world each day, putting out interesting content will get people interested, and will mean that they’re more likely to spread the video or image to their friends – which is free advertising. Mix things up. Change your cover photo regularly, and keep a stream of fresh content coming. Cover images especially rate highly in the Facebook newsfeed, and help give you more visibility. Use the timeline to your advantage. Add major events and dates for your business – this will help people search for and find things related to your business, and makes you look more legitimate in terms of search engine visibility. 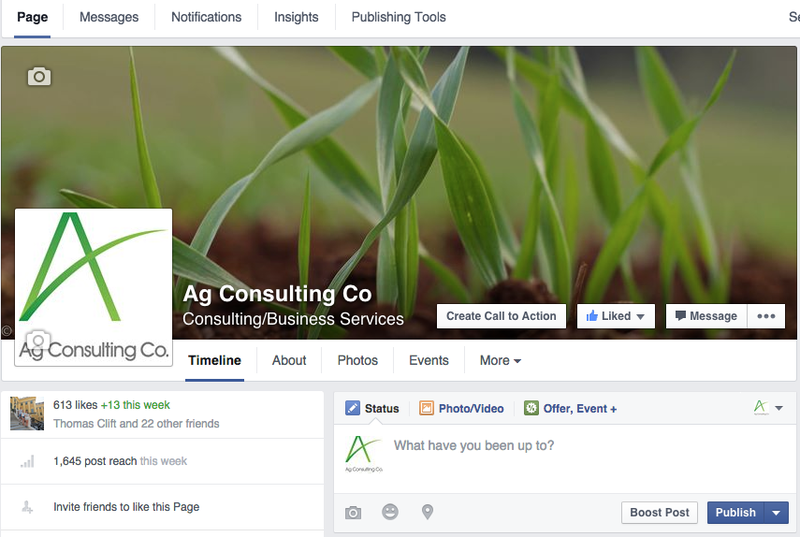 Guest post by Alice Long, Communications and Marketing Coordinator at Ag Consutling Co.